You wish to support SIDI’s technical assistance mission while saving ? « Faim et Développement » is the first social fund in Europe where parts of the interests are shared with an NGO. 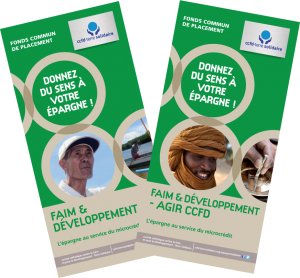 Initiated by CCFD-Terre Solidaire and Crédit Coopératif, this fund lets savers (residing in France) share 50 or 75% of their income with CCFD-Terre Solidaire, to finance SIDI’s technical assistance mission. It is possible to subscribe to Faim&Développement in any French bank with the following ISIN code: FR0010627232. It is also possible to subscribe directly with Crédit Coopératif, in any branch or via the following phone number: 08 10 63 44 44. The Finansol label guarantees solidarity, transparency and information of the « Faim et Développement » mutual fund. Share the post "Opening a social savings account"